If you’re seeing Caren Ray and Lynn Compton everywhere these days—not to mention vehicles, slate mailers, campaign signs, and television and radio ads bearing their names—that's no accident. The last Form 460 campaign finance disclosures before the Nov. 4 election were released on Oct. 23, and it’s become readily apparent that the race for the District 4 seat on the San Luis Obispo County Board of Supervisors in 2014 is one of the costliest—and more than likely the costliest—supervisorial race in SLO County history. 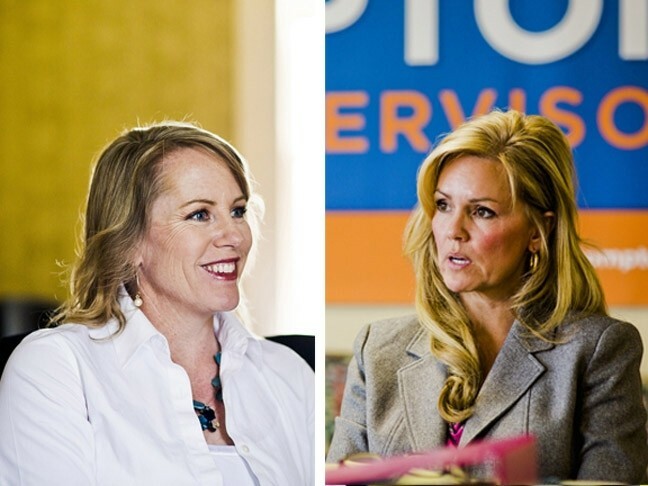 MONEY, MONEY, MONEY: To the tune of more than $675,000 in combined total cash, nonmonetary donations, and loans since the campaign’s outset, Caren Ray (left) and Lynn Compton (right) have battled fiercely (and expensively) for the District 4 seat on the SLO County Board of Supervisors. Precise figures for past campaigns are difficult to verify completely, but the campaigns of Compton and Ray have now raised more than $675,000 in combined cash, nonmonetary donations, and loans since the campaign’s inception in 2013. Ray, an Arroyo Grande educator and the current District 4 supervisor, has raised a total of $277,958.74 in cash, nonmonetary donations, and loans from the beginning of her campaign through Oct. 18. Compton, a Nipomo agricultural businesswoman, has raised a total of $397,637.87 in cash, nonmonetary donations, and loans in the same time period. When examining just monetary donations to their campaigns, the two candidates are more evenly matched; Ray has raised $265,337.85 in cash donations through Oct. 18, and Compton’s figure is $236,438. Compton has racked up $161,199.87 in nonmonetary (or “in-kind”) donations and loans—including $62,500 loaned by Compton to her campaign since the race’s outset, as of Oct. 18. In contrast, Ray’s total for nonmonetary donations and loans is $12,620.89 in the same period. As of Oct. 18, Ray has $500 in outstanding campaign debt, whereas Compton has $103,734.95. Compton didn’t respond to a request for comment from New Times.